It doesn't have to be complicated--simple meatloaf recipes make great dinners. Learn how to make a meatloaf no one can resist! Pressed together into a long rectangular shape, meatloaf consists of ground beef or pork and a variety of spices. Some recipes call for ground sirloin or ground turkey. Breadcrumbs and an egg hold the ground meat together. When mixed by hand, these blended ingredients form a succulent meat that can be sliced to serve with mashed potatoes and gravy. Some cooks say that anything can go into a meatloaf. Perhaps that is why the joke about grandma's mystery meatloaf continues to thrive. The preparation time for the simple meatloaf recipes below takes 10-15 minutes. Baking the loaf is where time is needed since most meatloaf dishes take about an hour to cook. Mix the breadcrumbs, onion, garlic, celery, green pepper, and carrots together. Add the egg, salt, pepper, and ground beef. Place in a 9x9-inch loaf pan. Bake at 350 degrees F. for 1 to 1 1/2 hours. Mix the ingredients for the sauce in a small saucepan. Heat for 5 minutes on low heat. Spoon onto the top of the meatloaf during the last thirty minutes of baking. Let stand for 5 minutes before slicing to serve. Serve with mashed potatoes and a side of cole slaw. 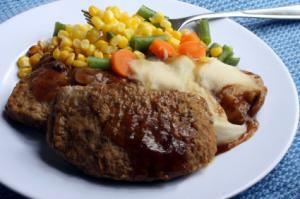 Mashed potatoes are a common side for meatloaf. For an Italian-style meatloaf, substitute the plain bread crumbs in the recipe above for Italian-seasoned. Add 1/2 cup of grated Parmesan cheese and omit the sweet sauce on the top. Instead, mix 1 cup of tomato sauce with salt, pepper, 1/4 cup of Italian dressing, and fresh or dried parsley. Pour this sauce over the meatloaf before the last thirty minutes of baking. This is a zesty variation. Mix the beef or turkey, onion, red and green peppers, celery, bread crumbs, mustard, and ketchup together well. Press half of the mixture into the bottom of a 9x9-inch baking pan. Add the cheese by pressing it onto the top of the mixture. Seal the edges with your fingertips. 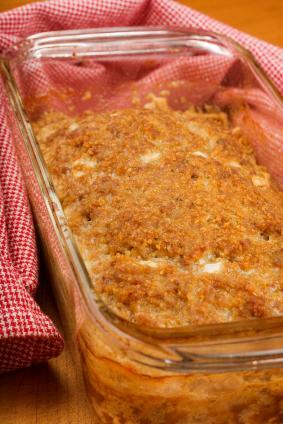 Besides the breadcrumbs, egg, and ketchup, there are other common ingredients used for baking a meatloaf such as a package of onion soup mix, a packet of beef soup, or a beef bouillon cube dissolved in a tablespoon of hot water. A dash or two of Worcestershire sauce can be added to any meatloaf recipe as well.